A pastor friend recently shared how God often shows up in the darkness. One thing struck me: How God sometimes cloaks Himself in order to grow our faith. Like the Hebrews and even Moses (Heb. 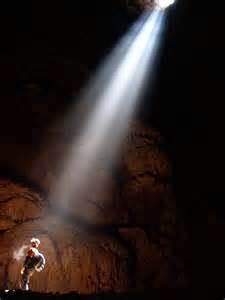 12:21) we may be full of fear; but, soon enough we find that His presence dispels our panic. It’s easy to freeze when fears arise; however, if we press on, like Joshua (Deut. 31:8), we soon find the promises of God made sweet by His presence. Honestly, I don’t always see God in the circumstances, but that’s okay. I know He’s near; even when my faith is small. And that is enough to keep moving forward. You can't wring your hands and roll up your sleeves at the same time.